If you are a company with over 50 buyers and sellers and your gross sales exceed over 10 Million US$, you must consider adopting a Private Exchange. A private exchange or a B2B portal is a website that provides a gateway to information relating to a particular company, its products and services and its buyers and suppliers. Many of the company businesses processes including supply chain, procurement and sales are also get executed through the systems integrated to this website. Our pre-engineered component -based Private Exchange solution is virtually risk free, easy to deploy and requires limited investment. In fact, we can guarantee that your return on investment will double within the first year of deployment. You can choose components for your Private Exchange from the list below. You can also order solutions from this list separately. Rusbiz sophisticated Internal Messaging System allows a participant of your Private Exchange send and receive messages from other participants. Since the messages do not leave your secured server, participants would not be worried about sending sensitive information over the Internet. Catalog based bulletin board allow participants to post Buy, Sell, and Informational announcements. Supply chain management solutions can deliver great values to your existing systems. Implementation of these solutions will help you achieving incredibly high return on your investment and will have tremendous impact on your business, which include: better productivity, faster order processing, greater visibility, the elimination of maverick; or unplanned purchasing, etc. This is the venue where suppliers can post their products for sale. A sophisticated shopping cart can be integrated to the electronic marketplace in order to automate the buying process. Electronic auction system can use both English and Dutch auction methods. For convenience the auction component can be integrated to the electronic marketplace. This solution allows you to automate your electronic procurement, where suppliers compete for your business real time online. The participants of the Private Exchange get a Storefront that reflects profile of the company, their products and other information. A Forum or Discussion Board is an organized, on-line interactive message board where participants conduct discussion on a set of topics by posting questions, comments and responses. 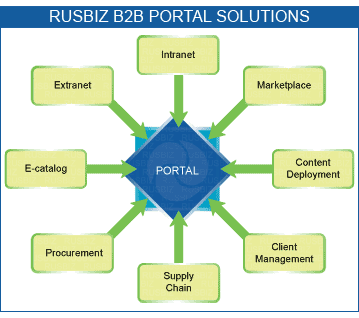 Rusbiz Forum solution is easy to integrate to any website. This is a listing of all registered participants either by business category or by alphabetical order. An advanced search engine tool is incorporated in order to find a company based on data provided. E–catalog — a hierarchy of product and service categories based on UNSPCS, a global products and services classification method that covers the broadest collection of industries and commodities available today, and designed to facilitate e-commerce transactions by providing geography-independent common nomenclature system. Product adding mechanism based on either easy-to-use wizard or simple but detail forms allow users to integrate products or services with accurate and up-to-date information. You can view many of these above mentioned solutions at work in Rusbiz.com portal. Read articles about e-marketplace, private exchange, etc.